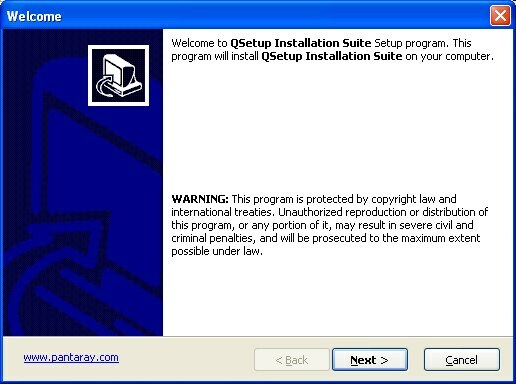 The QSTP sample will show you how we create the setup of QSetup itself using QSetup Installation Suite. This is the starting page of our setup. Please note that we were very careful to fill ALL the first 6 items. We have checked the Automatic option for Program Version: so the composer constantly updates the version number by reading the target executable. We could have left this option unchecked and fill this field manually. We are not using Split Setup and Non SFX Files so we left these two options unchecked. For Language we selected English (Default) so that our setup will only display the default english text during setup. 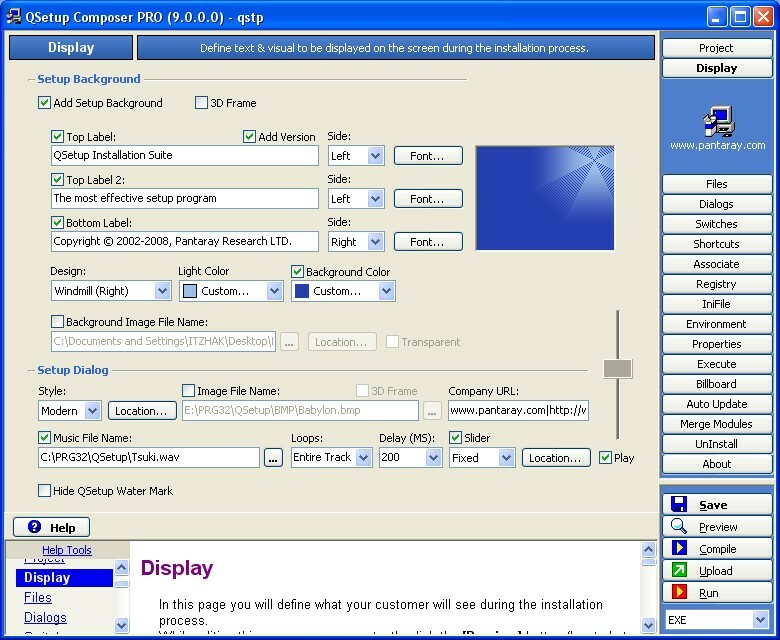 This page is used to design the background of the setup as well as some general parameters of the setup dialog. 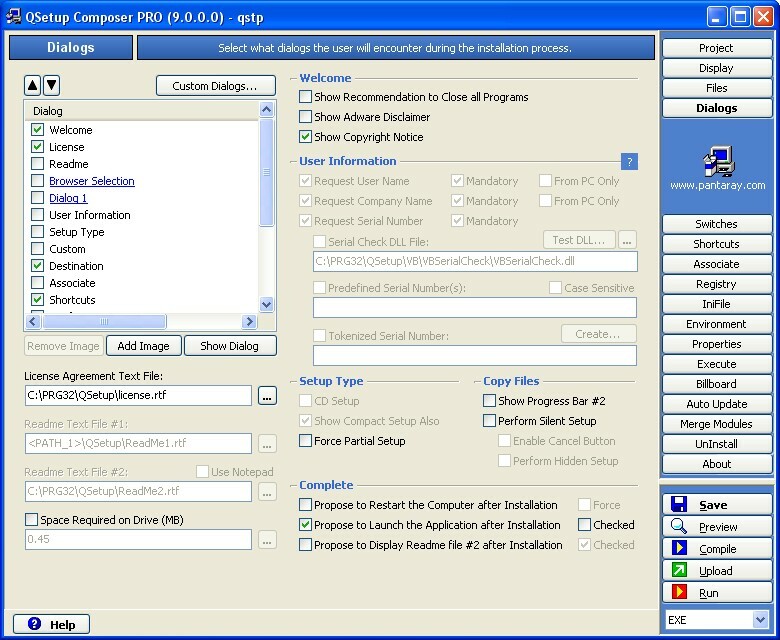 Note that the text in the Top Label was added automatically from the definition of the Program Descriptive Name field in the Project page. 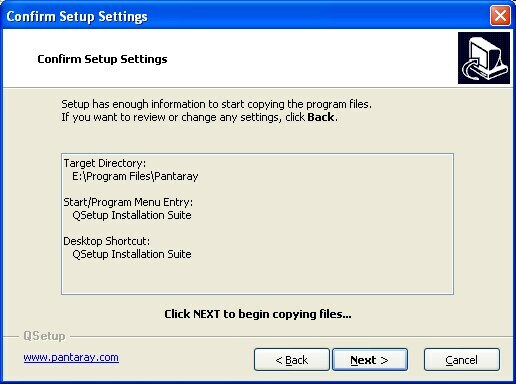 This page is used to define what files will be included in the setup delivery and their directory arrangment on the target computer. 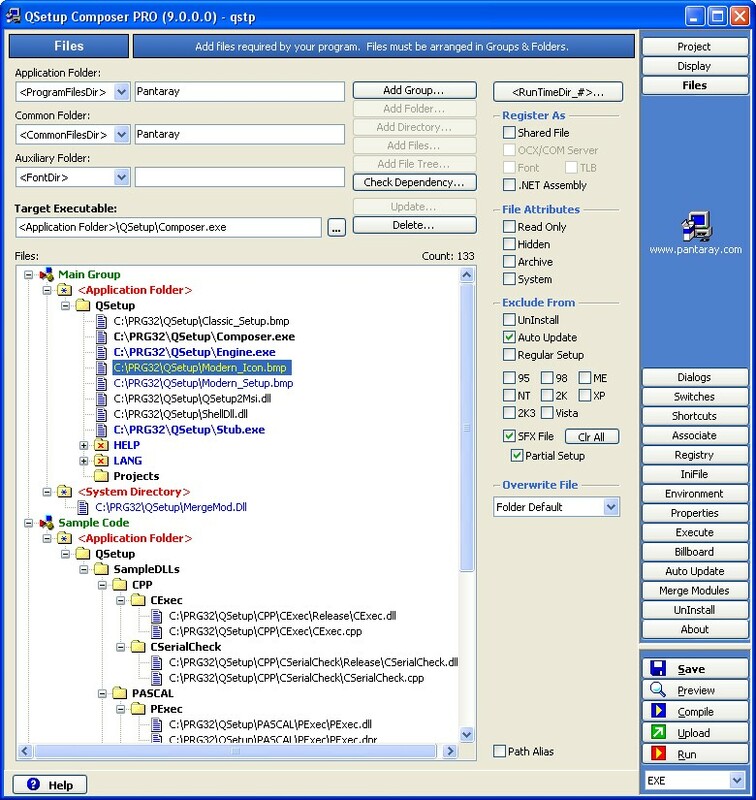 The text Pantaray in the <Application Folder> and <Common Folder> was entered automatically from the definition of the Company Name field in the Project Page. We are using 2 groups Main Group and Sample Code. The truth is that we could have used only one group because anyway we don't offer our customers the option to select groups during setup. However we use 2 groups for possible future use. The X in the Help and Lang directories indicate that those directories are marked as Force Remove. The Project directory is an empty one - it is just a place holder for future projects to be created by our users. Both groups actually point to the same location the <Application Folder>. the CExec directory include files that arrive from 2 distinct directories. In this page we select what dialogs the end user will encounter during setup. 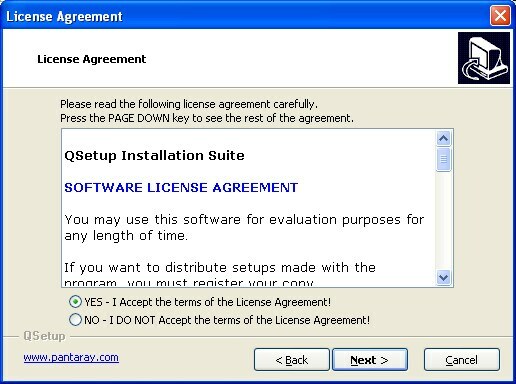 Out of the 12 dialogs that QSetup offers we use only 7. 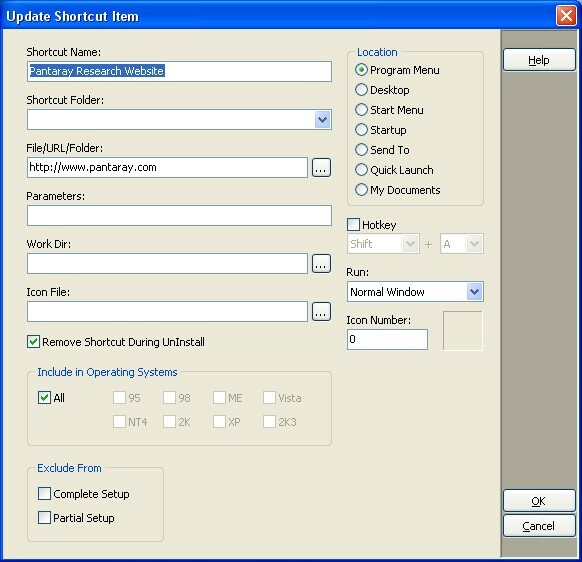 In this page we define the various shortcuts that QSetup will install on the target machine. It will also install a Desktop shortcut. 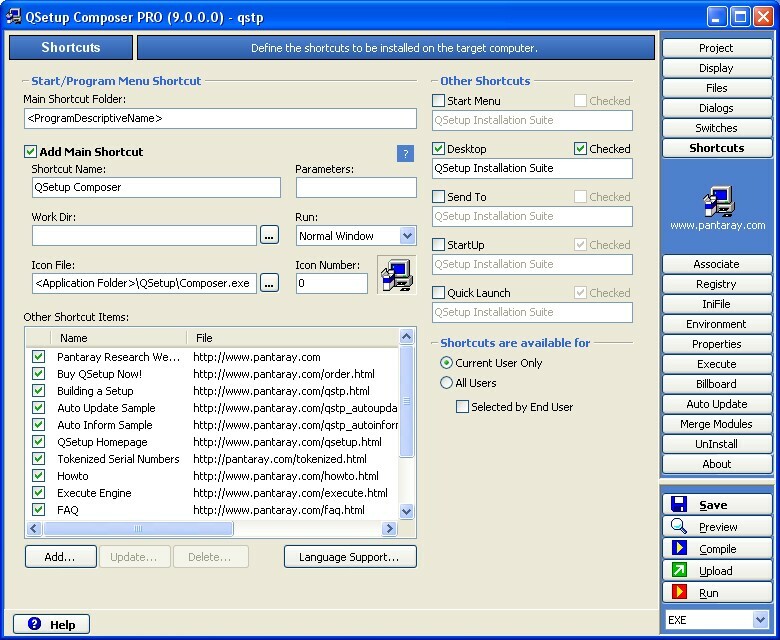 The text in the Main Shortcut Folder field and Desktop field was added automatically from the definition of the Program Descriptive Name field in the Project page. This dialog demonstrates how we create the QSetup Website menu item. 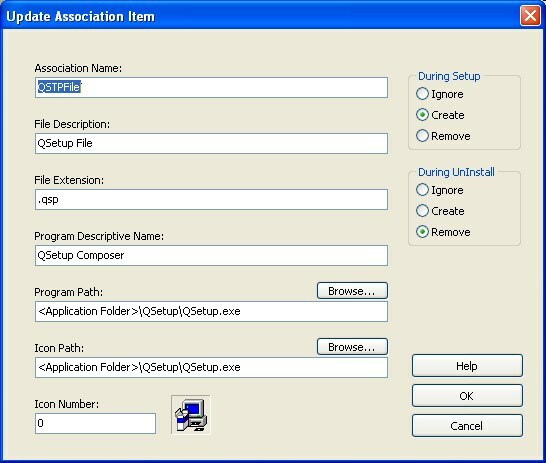 In this page we associate the extension .QSP with the Composer - that is when our user will click a file with the extension ".QSP", Windows will automatically open this file using QSetup composer. This dialog demonstrates how we define the association. We are using only one conditional execution command in our setup. 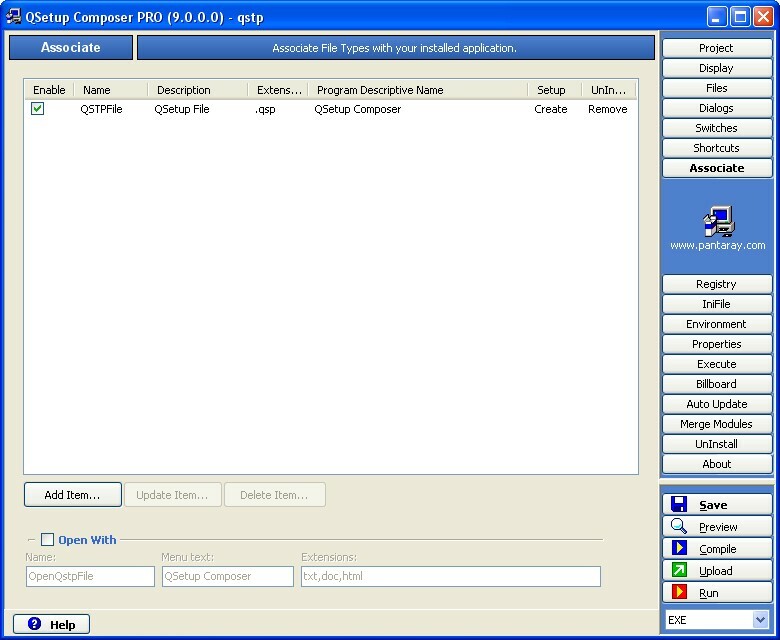 This command is used to remove a registry entry that is created by the composer. The condition is needed because we don't want this entry to be removed during the development of QSetup on our own private PC. 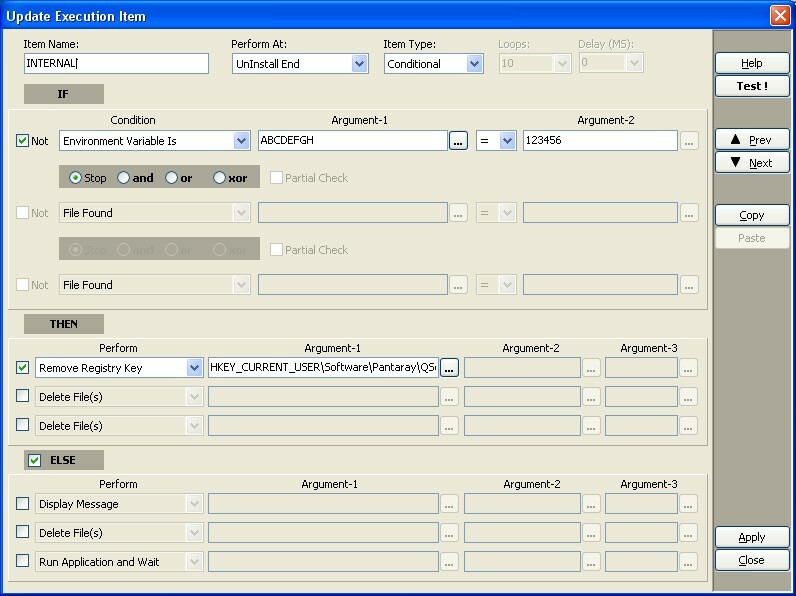 The following images shows all the dialogs that our user will encounter during the setup process. 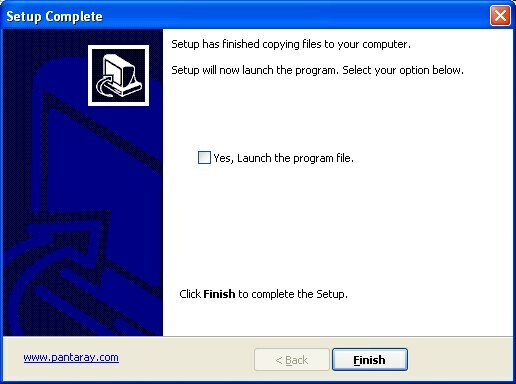 We are using Modern Style dialogs and the default images of the program.